Before every performance on my high school stage, my drama teacher would have all the cast and crew circle up in her class room and pass around “the magical wishing stick,” a plastic baton-like tube filled with gaudy purple metallic sequins. We would each silently make a wish on the “wishing stick,” a stick that had been passed around for many years before us, wished upon by dozens of other high school actors and actresses, and that as legend had it, held all the wishes from the past and present (cheesy, I know). Anyway, when I recently stumbled across The Thinking Stick blog, in my quest to self-educate myself on the wonderful worlds of teaching and technology, the wishing stick was the first thing to cross my mind. Similar to the wishing stick, however, I’m finding The Thinking Stick just as useful (and more) in helping me to understand the importance and advantages of using technology in the classroom (while keeping balance, of course) – and also, in helping me to form my own views on technology and how to incorporate them into my personality, vision, and future pedagogy. 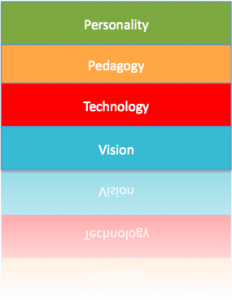 I first came across the post, Four Strands of an Educational Technology Position. Now, although I am not currently planning to become and Educational Technologist, Jeff Utecht, author of The Thinking Stick, offers four strands that he feels one needs to think about when preparing for an educational technology position and interview – and that I found incredibly useful when preparing for a Secondary English Education position and interview that will most likely require me to incorporate technology into my classroom. First and foremost an educational technology position that is looking to integrate learning into the classroom needs to be about personality. You can not, will not, get into classrooms if you can not create positive relationships with other educators. You must have a willingness to help others, to be patient with people as they learn something new, and just be an all around likable person. Without having the interpersonal skills nothing else in this position matters. Teachers will not invite you into their classrooms, they will not want to work with you and both you and educators will be frustrated with your work. Believe in something! There are many different views on the pedagogy surrounding educational technology, and you need to show that you have a view, that you stand for something whatever it is. Make sure you believe in it and be passionate about it. I might not have the best pedagogical view on educational technology, but I believe in what I believe passionately, and I believe that comes through in the interview. Know what you believe in, what you will help teachers achieve and how you plan on achieving it. You need to be familiar with technology, the latest trends, and tools, but honestly this is the least important of the four strands. Technology skills can be taught. In fact you’re going to have to learn new skills anyway. Whether a new e-mail system, a new student information system, etc. More importantly, is to show that you know how to unlearn and relearn skills quickly and that you have a network of educators via your PLN to help you out. This is one I did not think about but came from the high school principal as I was interviewing. Having a visions of where you believe the school should be in a given amount of time in important to school leaders. Be it 3 years or 5 years, they want to know that you have a purpose, that you have something you are working towards. Again believe in something and be passionate about it. In the end passion is what sells a good interview. Of course these strands do not only apply to educational technology positions and neither does passion. Being truly passionate in what you believe in, what you feel you can offer, and allowing the joy of doing your job show will win over school administrators. They want to be excited by you, they want to feel the energy you’ll bring to their school. Get them excited about you, about what you believe in and what you feel you can bring to their school. When I go into interviews I don’t worry about answering a question correctly, I worry about answering it honestly. If you don’t like what I believe in, what I’m passionate about, then I’m not a fit for your school or organization and that’s OK. But if we “click” and are on the same page then I want you to know that I’m passionate about what I believe in and am excited to work at your school. If you are interviewing for an educational technology position I think you can frame your answers around these four strands. Talk about your pedagogy, talk about how you build relationships with peers, how you use your PLN and that you have a goal for yourself and for the school. Focus your responses on these strands, and then put them to practice once you get hired. In the last three technology positions I interviewed for I have spent little time talking about technology, the questions always fall into these strands. Administrators want to know if you are a likable person. They want to know that you stand for something and have a goal. Nobody really knows what we do on a day to day basis and they have to feel confident they are hiring someone who is self-motivated, is passionate and has a goal of where they want to take the school. Very rarely do I ever get asked a technology question…whether it’s because administrators don’t know what questions to ask or that they believe in finding passionate people no matter the job title, brushing up on your tech lingo won’t do you much good. In the end….be yourself….because if you do get hired that’s who they will be expecting to show up to work every day. Thanks for sharing those resources, Laura. Awesome.